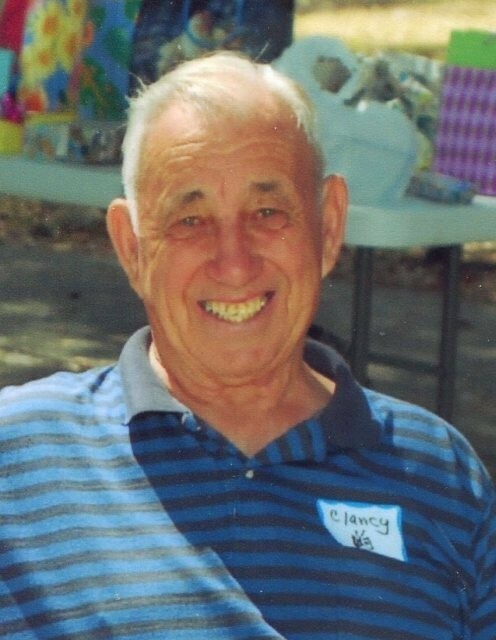 Obituary for Clarence "Clancy" E. Bellmer | Stone Funeral Home, Inc.
Clancy Bellmer was born January 25, 1934 to Charles and Margaret (Meyers) Bellmer. Clancy graduated in 1952 from Petoskey High School. While attending school he worked for Fochtman Motors through the co-op training program. Clancy enlisted in the US Army in 1953. He served two years in Stuttgart, Germany. He was honorably discharged in 1956. While stationed in Germany he returned home on furlough to marry Bonnie Caron on December 30, 1954, at The First Christian Church, officiated by Rev. Floyd Emswhiller. Shortly after leaving the Army, Clancy worked for the Kroger Co. for ten years. He went on to work several years as produce manger at the Crago Grocery Store. Clancy retired from Michigan Consolidated Gas Co. in 1994 after 26 years. Clancy loved the outdoors and always had a smile on his face. He enjoyed managing several Little League teams. Many of which his five sons played on. He was a charter member of the Petoskey Snowmobile Club and served as President several times. He was very active in the purchasing of the property and building of the clubhouse. He was a long time member of the Petoskey Oddfellow Lodge #282 and a member of the Northern Michigan Antique Flywheelers. He enjoyed volunteering at Manna Food program and at the Red Cross. In the early '70's he owned "Evergreen Pheasant Farm", where he raised and bred ornamental pheasants from many parts of the country. He also raised Bantam chickens. After retirement he took up wood crafting; making toy boxes, tables and chairs, and toys for his eight grandchildren. He also sold his wood crafts at craft shows in the area. He took great pride in his yard and flower gardens which gave him an excuse to be outside most of the time. When winter rolled around Bonnie and Clancy enjoyed their place in Brooksville, FL. Clancy is survived by his wife, Bonnie; five wonderful sons, Rick (Amy) Bellmer, Steve Bellmer, Joseph (Susan) Bellmer, Tom (Wendy) Bellmer, and Dan Bellmer; 8 grandchildren, Jennifer, Sam, Tony, Morgan, Cody, Nicole, Tim (Chelsea) Bellmer and Rob Curnow; three great grandchildren, Jack Casteel, Annabelle Bellmer and Damian Curnow; sisters, Marge (Bob) Gregory, Mary Jane Lyons and Bonnie Carpenter; half siblings, Cathy and Bill Swanson, Charlotte and Tim Drayton, Cindy and Mike Starkey, Joe, Leslie, Matthew and Simone Bellmer; step brother, Michael Bellmer; and step sister, Robin Benzinger. He was preceded in death by his parents, Margaret and Charlie Bellmer; sister, Charlene Bellmer Hartsough; brothers-in-law, Jim Lyons and Louis Carpenter. The family will host a gathering at a later date. Friends and family wishing to make a charitable donation in memory of Clancy are asked to consider the Manna Food Project.